The modular ELEMENT concept from Bürkert combines controllers, valves and sensors in an attractive high-quality stainless steel housing with intelligent and flexible system architecture. By expanding the valve line to include drive sizes up to 130 mm, globe valves of the ELEMENT series can now be used to achieve fittings up to orifice diameter DN 100, angle seat valves up to DN 65 and diaphragm valves up to DN 50. In the production of foods and beverages, and also of pharmaceuticals and cosmetics, the requirements for hygiene and process reliability are especially stringent. The fittings used here have to be able to be cleaned quickly, easily and, above all, thoroughly. 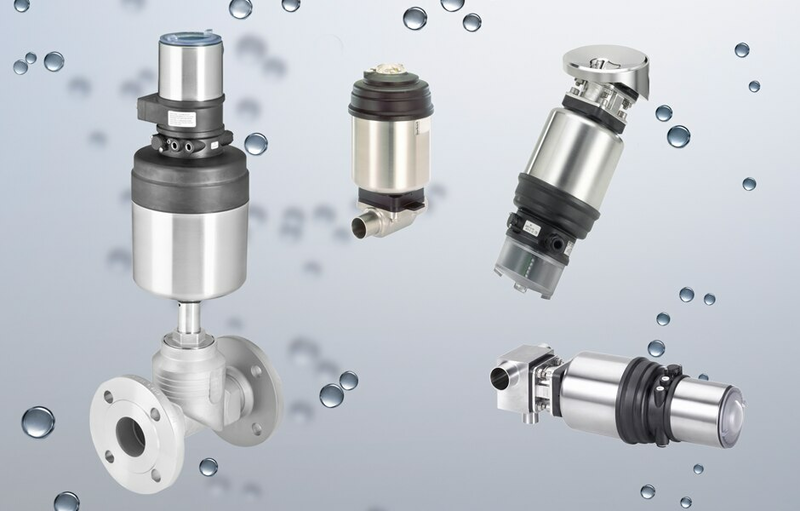 The valves, controllers and sensors of the ELEMENT series from Bürkert are manufactured entirely of stainless steel, which makes them ideal for use in hygienic processes, since they can be cleaned easily with all methods commonly used in these industries. Bürkert is now expanding the line of valves in the ELEMENT design and is increasing the maximum available orifice size of the seat valve type 2100 (angle seat On/Off), 2101 (globe valve On/Off), the control seat valve type 2300 (angle seat) and 2301 (globe) from 15 to 100 mm. This significantly expands the area of application for these valve types, enabling their use at higher medium pressures on pipelines with an orifice opening up to DN 100. The expanded area of application now makes it possible to equip many systems entirely with fittings from the ELEMENT series. The advantages of the modular ELEMENT platform can be used comprehensively. The valves and sensors reliably control fluids, steam, caustic solutions and chemicals, as well as abrasive or high-purity substances in many applications and process environments. The stainless steel valves are very rugged, hygienic and easy to use. The special drive design facilitates integration of automation units at all levels of the modular valve system, from the position transmitter to the electro-pneumatic positioner or process controller. This concept allows complete decentral automation of even complex systems with minimal expense for cables and hoses. Media steam, water, alcohols, fuels, hydraulic fluids, saline solutions, alkaline solutions, organic solvents and neutral gases.